1. Once you have clicked the Create button, it will bring you to the Programs page. Click on the Customize button to begin editing the appearance of your punch card. 2. Edit the background, foreground and label colors. 3. To add a logo onto your card, just drag and drop a logo image. You will then be prompted to crop the logo if necessary. Logo size will be automatically adjusted. 4. 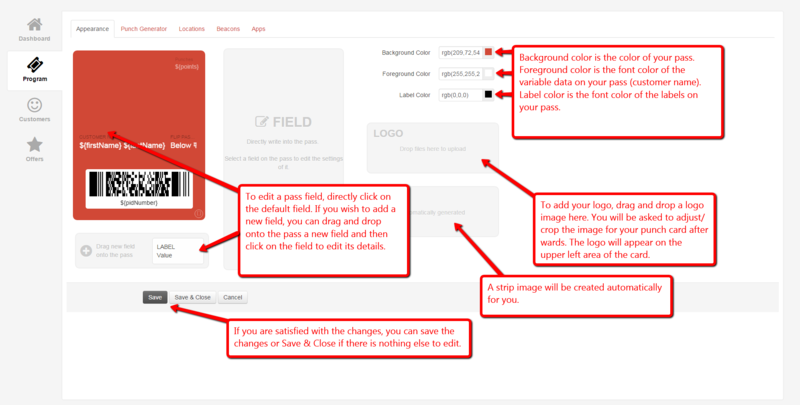 If you wish to add a new field onto the pass, simply drag and drop a new field from section with a circled plus sign (+). To edit the field details, directly click on the field and type directly to edit the contents. 5. Click here to proceed to Step 4 to edit the Punch Generator strip image.